Pritesh Mistry reviews the weekend action in the English Premier League. All eyes were on Loftus road for the first fixture of the week 22 as Harry Redknapp faced his former club managed by Andre Villas Boas. Julio Cesar kept QPR in the game with some crucial saves. It was a hard-fought point which pleased Redknapp, especially after having beat Chelsea at the bridge in their previous encounter. Knowing Spurs had not failed to score in any away game this season, QPR earned a very valuable point by keeping the duo of Lennon and Bale quiet for majority of the game. Aston Villa were looking to make amends after their shock defeat in the Capital One Cup against Bradford. It only went from bad to worse for Villa as the Saints scored the only goal of the game ensuring Villa slipped into the relegation zone. Rickie Lambert scored from the spot after the referee awarded an extremely generous penalty for Enda Stevens's challenge on Jay Rodriguez. Villa posed too little a threat up top during the first 45 and looked vulnerable on the counter attack, while, in the second half, Southampton 'keeper Boruc only had a couple of crucial saves to make. 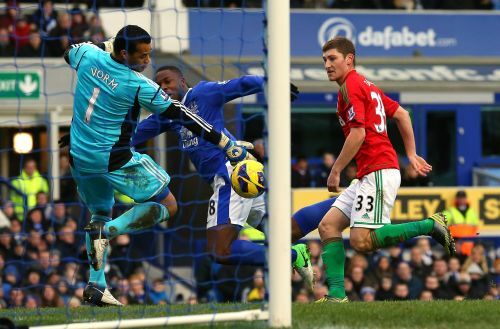 Everton looked boosted with the presence of Baines, who overcame his ankle problem. Fellaini, Pienaar and Jelavic were involved in most attacks Everton could create as the Swans proved to be resilient as always. The in-form Michu hit the woodwork once as he came closest to giving the Swans a lead in the game. Everton were the better side over the course of the ninety and David Moyes would probably be regretting that his side couldn't beat a hard working Swansea team. Fulham and Wigan shared a point as both sides came up with equally brilliant individual efforts, Karagounis for Fulham in the first half and Di Santo for Wigan in the second. Fulham gave it their all in the latter stages of the game searching for the winner as they bombarded the Wigan penalty area with crosses. There was unbelievable late drama at the end at Craven Cottage as Bryan Ruiz's shot was cleared off the line by Figueroa. This was one game which will not live long in the memory. The stalemate ensured halts of defeats for both sides. The only positive for Newcastle United and Alan Pardew was that Coloccini played well despite having already decided to leave the Magpies. Newcastle attacked without any end product for their strikers upfront and Norwich showed a real lack of confidence in their attacking play failing to find the right crosses. Reading produced an amazing turnaround by scoring three goals in the last eight minutes of the game coming back from two goals down scored by on loan Chelsea forward Romelu Lukaku. West Brom looked very comfortable and were well on course to beating Reading on their own turf, but McDermott's resilient Reading had other ideas. There seemed no way back for Reading but with 10 minutes left Kebe scored at the back post with a low header of McCleary's cross. Reading began to press hard and, with two minutes remaining, Kebe won a penalty against Olsson on the edge of the West Brom area which Le Fondre tucked away calmly to Foster's left. The unimaginable comeback was then completed when Harte launched a free-kick into the box, Alex Pearce knocked it down and Pogrebnyak nicked the ball past Foster. West Brom manager left shell-shocked as the incredible Reading comeback delighted McDermott. Chelsea dismantled an unusually poor Stoke City at the Britannia stadium, ending their undefeated streak at home. Chelsea looked menacing in every attack; the first goal was turned in by Walters into his own net. Chelsea's crossing and movement was too good for Stoke especially during the second half. Walters not only scored two own goals, but also missed a late penalty. Chelsea's best goal came from Hazard who riffled in a left footed effort into the top corner pass Begovic. Frank Lampard proved to be Mr. Reliable yet again from the spot as he blasted in a penalty won by Juan Mata. Considering Stoke had only conceded seven goals all season, this Chelsea win looked even more emphatic. Sunderland overcame a sorry West Ham United very comfortably as they discovered their scoring touch with goals from Sebastian Larsson, Adam Johnson and James McClean. West Ham never really got going at any point in the game as they lacked any sort of intent in defense, attack as well as passing. Sunderland, on the other hand, were brilliant from start to finish. Man United started the big game with great control, movement and possession. It was one of those crisp and one touch attacks which created the first goal for the Red Devils with none other than Robin Van Persie at the end of a Patrice Evra cross. During the course of the first half, Liverpool struggled to keep up with the passing or movement of the United players. Liverpool gave the ball away cheaply on more than one occasion and were lucky to have gone into the break with only one goal down. United started the second half much like they ended the first and they didn't have to wait too long before they doubled their advantage. Liverpool almost immediately got one back as substitute Daniel Sturridge followed in with a shot parried by De Gea from close range. United stiffened their defense by bringing on Smalling and Jones for Vidic and Kagawa respectively. Liverpool tried hard, but United were too difficult to break down. The game was eventful right from the word go as Laurent Koscielny was sent off after just 10 minutes for a clumsy challenge on Dzeko in the box. Dzeko failed to materialize, however, Manchester City kept the pressure on the Arsenal back line which soon paid off. Milner came up with a blistering effort which rocketed to the right hand post of Szczęsny. The evening went from bad to worse for Arsenal as they struggled to defend against City attacks. Dzeko doubled City's advantage and it seemed that Arsenal were in for a thrashing. In the second half, Wenger decided to give it all up front by bringing on Giroud and also took Diaby off who looked understandably rusty after his return from Injury. Arsenal were given some hope as Kompany was sent off with 15 minutes to go, the decision was really unfair on the City captain as he had clearly won the ball. Arsenal gave it their all towards the end; however, City were too good to be broken down.